Good luck Anders and be safe OK?. Have Fun, Go Fast, Stop safe. This is the v.1 engine (JU-01) that I used both for the ice race and last years One Mile where I ran 275.3km/h at best with a very crappy start and being unable to get tucked down properly behind the fairings. The new JU-02 engine I am building needs some "dyno time" in a thrust measuring test rig to sort everything out before I install it in the bike. Knowing that I modified and redesigned roughly 1/3 of JU-01 over a period of a couple of years after it was first started I have decided not to rush anything, as long as the old engine is running I can keep tuning and racing the bike while getting the JU-02 engine sorted out on the side. 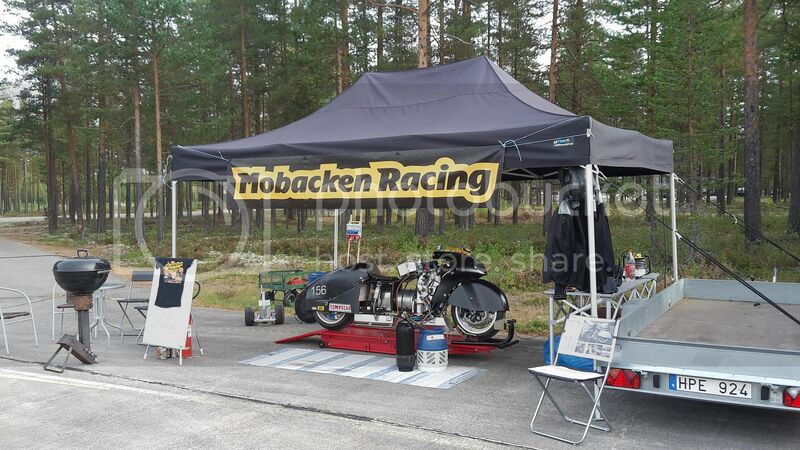 I am in Färila drinking light beer and eating sausages while watching the rain pour down outside the race tent, tomorrow looks better so hopefully we will be able to race as soon as the track has dried up. Labor Day and I'm working!!!!. 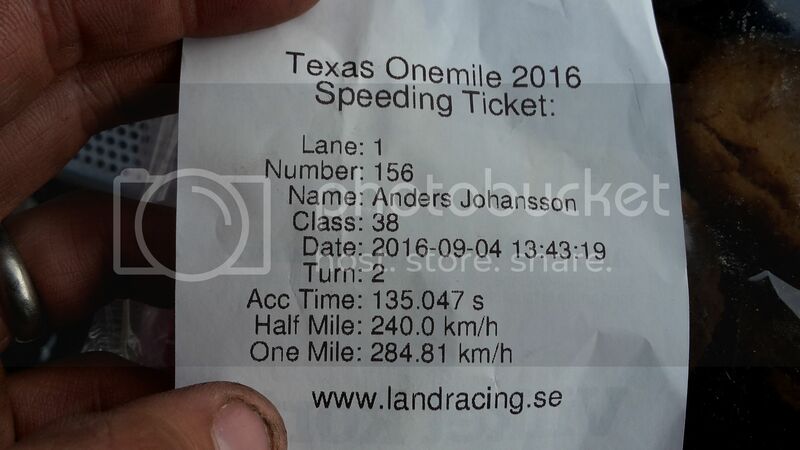 Sorry to keep you waiting, I´ve just finished the videos from the weekend and am proud to announce a new personal best of 284km/h! It rained until 10 in the morning on Sunday when I talked my way into being allowed to do a slow test run down the still wet track, I figured that if I could do that the weekend wouldn´t be entirely wasted. Luckily the rain never came back and the track dried quickly thanks to wind and lots of performance cars making 250+km/h passes down the wet track. Crazy bastards. Two hours later when I had filled up the bike with kerosene and charged the battery I made a full throttle pass, apparently the fuel injectors can´t supply fuel for more than 2.6bar boost pressure so I didn´t get any more power out of the engine than last year. A better start and the fairing job made me raise the official speed from 267km/h to 284km/h so I am very satisfied with the weekend. I can get a bit more power out of the engine for next year by injecting a couple of liters/min of water/methanol mix into the compressor inlet, so hopefully I am able to break the 300km/h barrier next year! Well, those videos shot the heck out of my afternoon chores. Really -- I was gonna mow the yard and stuff, but seeing those once - required another view or two. Thanks for the fun, Anders. Now I see the reason for the 'quick get-away' at the end of the run. The front wheel trailer is doing a great job to get the internal temps down. With the rear wheel spinning air is being pulled throught the engine by the power turbine wheel so by the time I get back to the pits the temps are down to only 200°C or so instead of the 700-800°C just after shutdown. Jon sent me info about a full length trailer which is probably better for a normal bike but this one turned out to be just right for me. Super, great Job. Next year you will do your 300.